♥Original Design and high quality! ✔ You will get 1 .JPG file - 5x7” for a Photo Printing and one .PDF file with 2 Boy Elephant Printable Bingo Game Card per page. You can print as many as you need. 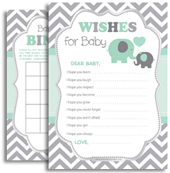 ⓟPERSONALIZATION: This Boy Elephant Bingo Cards can be personalized with NAME, date and you can have even different color for an extra charge - please contact us prior to the order for a quote/price (don’t forget to write the SKU(code) of the design you like). ✄Bingo Game Cards, ideally, are designed to be printed on a white cardstock paper or to be printed on the matching 5x7 cardstock.